I need something to eat. I'm on night duty now. Medical Care Law established detailed rules for hospital dietetics and one of the night shifts has to eat and check the dinner for the patients. Today I checked. The hospitalized patients should hit the hay at 9 o'clock. However, I have to stay up until midnight. I'm famished. Today would be kind of an aniversary day, because I talked to an native Korean student for the first time. I was glad my pronunciation was good. When I was walking my dog a couple of weeks ago, I met some junior high school students who were North Korean residents in Japan. There is a Korean junior and junior high school near my house. I tried to speak a couple of phrases in Korean. "Hello! ", "This dog's name is Mocha. ", "See you!",,,. All these phrases were understood by them. However, they were born and grew up in Japan. I mean, they were not native Korean. Today's lady was literally a native korean. She has been learning economics at Matsuyama University since last September. I was lucky to know her. I asked her to meet me a couple of times a month, one hour each session, somewhere in her campus. Next time I will introduce myself in korean. I'm writing a text of self-introduction now. I'll have it corrected by her and memorize the correct text. I feel Korean spicy foods are waiting for me in the Korean Peninsula. I gave a lecture to students of the technical college today. Today's topic was dementia. This is not my major, so I had to learn it last night. Hasty cramming is only hasty cramming. Cold sweat broke out all over my shirt during the lecture. I might not be good at teaching, but teaching is useful for me. Advances in science are prompt. Teaching something needs re-organizing knowledges in my brain. I gave my parents the pneumococcus vaccine today. This vaccine is not so famous as the influenza vaccine, although there is a lot of evidence that shows the efficacy of the prevention of the infection of pneumococcus. I don't know why. By the way, I got a shot of the influenza vaccine last November because influenza is highly contagious in Japan now. I've been visiting the same barber for more than 30 years except for the period when I didn't live in Matsuyama. The barber's shop is managed by a hearing-impaired, married couple. Their pronunciation is far from the normal pronunciation and they seldom speak to strangers. It's so quiet except for the sound of the TV in the barber's shop. Besides, most customers don't speak. Consequently, the atmosphere in the shop is a little weird. If someone came in this shop for the first time, he must feel a sense of discomfort. I can catch what they talk about, but I don't like to speak during my haircut. I usually have a comfortable nap there. Today I had a haircut and got very relaxed. I know that 2 physicians and 3 surgeons are accessing this weblog. I'll write about the inguinal hernia repair today. Generally speaking, Japanese inguinal hernias are smaller than those of western people. It's considered to be due to the difference in the build. Anyway, there are several methods for reinforcing the abdominal wall. Originally, in Japan, there were rare cases using a mesh. When the hernia was not so big, we didn't need such an artificial device. However, the reinforcement by a mesh became popular in Japan at this time. The reason is that the mesh technique is easier and doesn't require much knowledge about the anatomy of the inguinal portion. I think it's lamentable. Doctors-in-training wouldn't study so hard. In case of a recurrence of inguinal hernia or occurrence of femoral hernia after the mesh operation, they couldn't deal with it properly. I'm waiting for your e-mails. Every Thursday night I attend the English speaking club. Last night a party was held for a newly married member. The city has many spots in the downtown and also in the Dogo Spa area and in other places. We went to a western style restaurant in the Okaido area. I did a house visit today. The weather was fine and comfortable, and all the patients were stable and I didn't have to do anything unusual. Consequently, I could save time. If I got back to the hospital directly, I needed to work more. I plotted with a nurse and a driver to kill the time over a cup of coffee outside the hospital. We could spend a relaxing time outside. 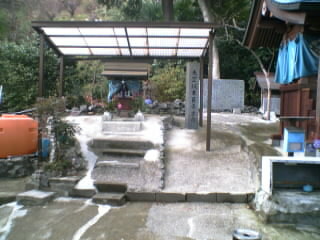 Hot springs are around every corner in Matsuyama city. My wife and I went to one of them called "Saya Onsen" last night. My wife likes to get esthetic treatments, so I always have to wait until it finishes. Besides, it was so relaxing to lounge in the spa. Consequently it makes me want to stay in the tub for a long time. I got bath reaction. I couldn't have enough breakfast this morning but recovered before noon. I got up late with a hangover. I had a fugu party with my network friends last night. Though fugu (balloon fish) is kind of poisonous in some parts of it's bowel, it is so delicious when cooked properly. I was off today. I went out for a long walk with my dog "Mocha". I live near my Alma Mater now but I don't know this area so much because I have been away for 15 years. Besides I usually use a car or a motorcycle when I go out. 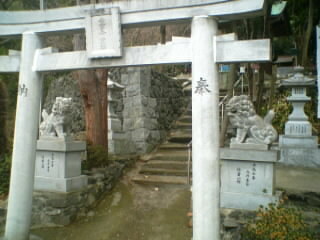 To my surprise I found a small shrine honoring a feudal lord. There is a hill near my house. They say there was a castle on top of the hill about 400 years ago and the lord and his son were killed through disembowelment. The history of the area was written on a brass plate. I wondered what scenery those people had been seeing. No buildings, no elevated roads, no trains, no planes,,,. Today is Saturday. I've scheduled an easy operation today because I have an appointment for a party with my friends this evening, so the operation never dragged along. The operation was an inguinal, direct hernia repair. However, I couldn't get the patient anesthetized. The 79 year old patient has a history of multiple operations of the spine. His spine was like steel. It's the first time for me to fail the spinal tap in 20 years. I'm so sorry. Actually his spine was partially braced by the steel. I'm going to give him surgery next week under general anesthesia. When I got into a junior high school 35 years ago, I studied English as a subject of the school. In those days it was almost only through cassette tapes that I could listen to English conversation between native speakers. Fortunately, there were several Fathers in the priest's house adjacent to the school, because my junior high school was established by a Christian group. The Fathers were Spanish. They taught me English at the class, but I didn't have any interest in the English class. If I had been interested in English at that time, my knowledge of English would have been better now. Now I have many opportunities to hear English, even in Japan. I'm writing this over CNN. However, I seldom speak English in my daily life. In order to get opportunities to speak English, I'm attending an English class for working people. Various people are in the class. It is kind of fun to attend the class. One of the members got married last month, so we are going to have a party for her. There is a serious rule for the party. You know, we must keep talking in English only, never Japanese. However, the more alcohol gets in the body, the more broken my English gets. 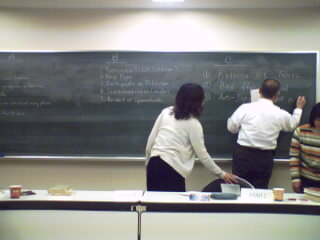 The photo shows today's class, in which a member is listing the Top 5 news stories in the world and in Japan. It's my policy to take life one day at a time. I'd like to be better in all senses tomorrow than today, next year than this year. I'm making it a point to always have some fun in the near future. I'm happy to feel myself changing for the better. I started writing this blog last November and continued for 2 months. Now blogging has become kind of fun. This turned my thoughts to thinking routinely of the way of thinking of foreign people. A couple of e-mails came to me every week from many places all over the world. I was really moved to feel English is an international language. Most of them were from physicians or surgeons. I could find out about their daily life, which is not on the news or TV programs. It's fun and amusing to me. I'm thinking I'll write about daily events. It must be fun for them, just as their daily life is fun for me. The other day, I got to know a certain Korean student. I asked her to check my pronunciation of the Korean language once or twice a month. I didn't have any interest in Korea and could not read or understand any Korean word one and a half years ago. However, I can do so a little now. Though I've never been to Korea, I could be routinely dining in Seoul or Pusan, which are easy to access. Seoul has a direct flight from here and Pusan has a sea route from the port of Shimonoseki, near my hometown. Today is a national holiday in Japan. I was awakened by muscle pains in my lower legs. I had a muscle ache in my lower legs when I over-extended myself, abdominal pain when I lifted myself up and chest muscle pain when I raised my shoulders. Anyway I had muscle pains in my whole body. I went down the stairs like a patient with casts. My wife said "Age tells." My second youngest daughter said "You must be getting old. I will be a better skier than you in the near future." This winter I and two of my daughters got new skis. Today, I went skiing with my youngest daughter. I have three daughters. The youngest one is the best skier of them all. 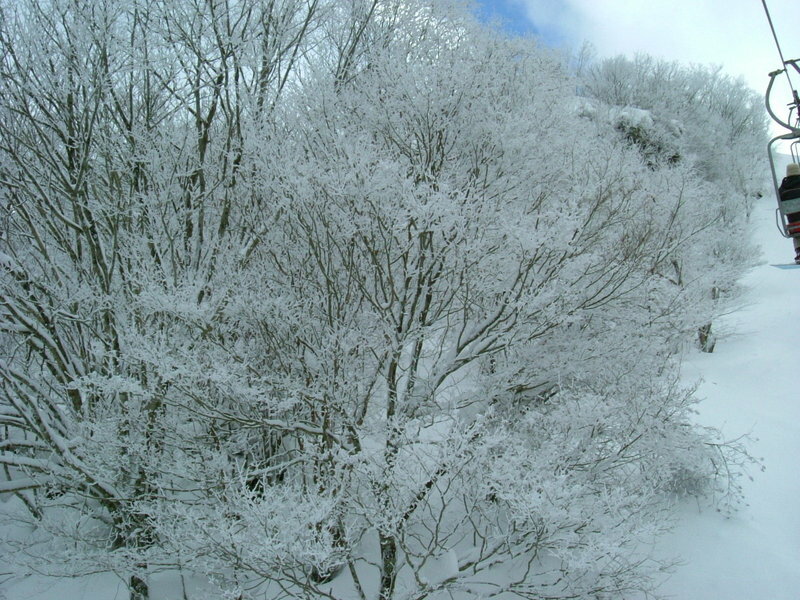 These days we haven't had enough snow here in Ehime prefecture. They say it's because of the effects of global warming. As I wrote before, however, this winter we have enough snow. We enjoyed skiing to our hearts'content. Photos are taken just below the top of the ski area. I attended a special lecture at Matsuyama Univ. The topic was a Korean Confucist, Kanhan, who had brought Confucism to Japan in 1597. He was captured by the Japanese sea forces and confined for ten months to Ozu city, which is near my hometown. After that he was transfered to Kyoto which was the capital area in those days. He met the most sophisticated people there. He enlarged the number of his friends and lots of people got to show him deep respect. He taught them the fundamentals of Confucism and wrote some textbooks. Those books were the sourcebook which was passed down the generations. After the death of the absolute ruler, Hideyoshi Toyotomi, he got his freedom and could go back to Korea. Confucism was a backbone of the nation in the Edo era and in modern Japan. This was a bloodless revolution without any bleeding. There is no revolution in the world that can rival it. I suppose this bloodless revolution could be achieved because of the confucian ethic that every Japanese kept in their heart. The post world war 2 reconstruction in Japan was successful. I believe this was because of the confucian values which every Japanese had. The U.S.President Bush said, Iraq and Japan are similar, and so Iraq can make a recovery like Japan. He doesn't know the spiritual difference between Iraq and Japan. I was mad at him after hearing him tell such a silly thing. He is nothing more. Our Japanese had been getting kind of an education of the confucian ethic for about four centuries. Confucism is a backbone of Japan again. I'm ashamed I didn't know how Confucism was born in Japan at all. Besides, such a great historical event had something to do with my prefecture "Ehime". There are lots of pending issues between Korea and Japan. However, I hope both countries get close to each other from the bottom of my heart. We are alike. I really felt so today. It's overcast and windy today. The weather forecast says there will be snowfall even in this southern part of Japan. A big snowfall is uncommon in my city. I'm so sorry for the people who live in the north, but I feel excited. I'll go skiing this weekend. 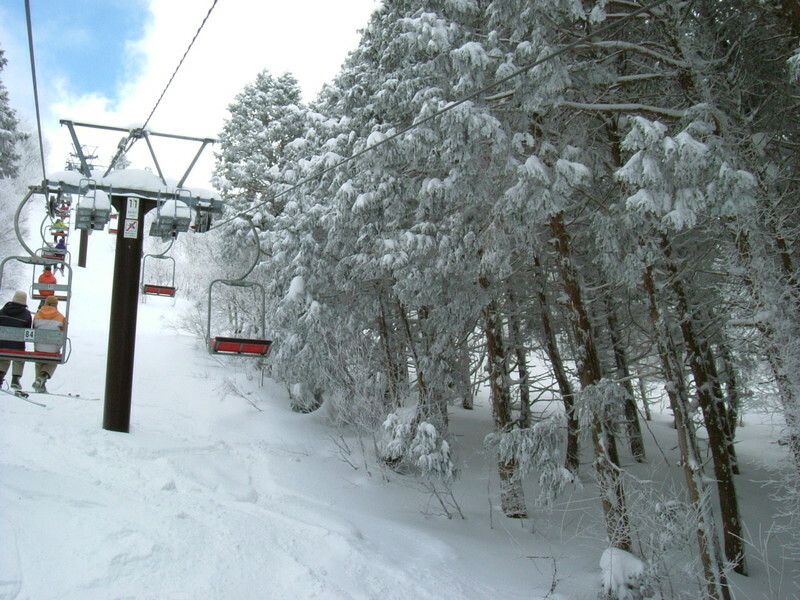 This winter Japan has a record snowfall across the country. The weather is something different from usual. At the end of last year one of the safest public transportation systems, the JR express train derailed due to gusting winds or tornados. Some people were killed and more were injured. In the northern part of Japan more than 50 people have died because of the massive snowfall and related problems. Today kicks off another year of work. I attended the morning assembly. My boss abruptly ordered me to say something suitable for the day to everyone. As you are maybe thinking I didn't have anything prepared. I was upset. "Well, another year has started. We'll work hard but our health has to be the first priority." That's all I said. I had to stay in hospital all day long today from yesterday. The hospitalized patients in the ward are stable. A few patients are critical, but there's nothing special to do for them. In such a context it's relaxing today. A friend of mine dropped in on me in the hospital in the evening. He wanted to know the fundamental setting of HP200LX. I showed him how to set each of the files in the file of autoexec.bat or config.sys. 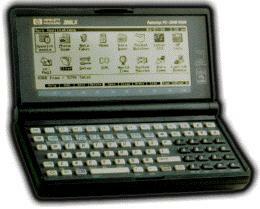 HP200LX is a handheld PC driven by 2 AA batteries. I've been using this handheld PC for about 10 years. It is one of the important peripheral devices for me. This made-in-the-USA machine was very popular in Japan but the PC maker (Heulett-Packard) stopped production about 5 years ago after 5 years of sales. To my surprise the spec of this PC has not been changed for 5 years. It is incredible in the production of PCs. Most PCs would be renewed one after another in a short cycle. The bottom line is, HP200LX was one of the perfect PCs. At the end of production, I got one more HP200LX for future replacement. It is always with me.